Are you purchasing or considering the purchase of a pasteurizer? You have prices on equipment from three suppliers: The "larger" and "reputable" company has a much higher price machine - and you stand to save a significant amount by using a smaller shop that has made a number of warmers and coolers? Did you mention this to the "reputable company" and they don't seem to care? Sound familiar? ENERGY MATTERS: Remember that this equipment is moving the temperature of every package produced, day in-day out. Your utility bill for adding pasteurization to a packaging line can be from $20,000 to $250,000 per year. 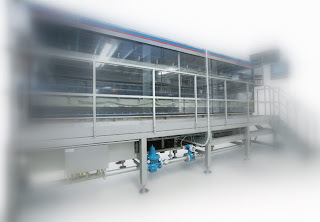 Machines that are not "optimally" designed will simply correct the engineering deficiencies by utilizing extraordinary levels of water and steam. This is why the "big boys" don't really care about your quote from Bob's metal shop - they understand the carrying cost of having the talent on staff, and your competitors have told them with their dollars over the years that it makes sense. QUALITY MATTERS: No one will care how much you saved on capital costs during a product recall. There are scenarios on the packaging line - e-stop, power outage, boiler failure, air loss, stoppages, unbalanced loads through the machine, skippers, etc. which play havoc with the process. You need to rely on the process that it can handle these conditions appropriately, and many of them are difficult. In some cases, the machines are just not designed to get the right amounts of heating and cooling where needed internally to handle these situations. Demand a utility monitoring system is included in the Base Price of every quote you recieve. Get data on steam and water consumption. Electrical usage generally stable on all machines. Steam and water will constitute the bulk of your utility spend, and will be variable. Ask for a utility guarantee linked to final payment. The guarantee is useless without the monitoring equipment. Be sure to qualify the requirements of water usage on "product run in", the time and energy required to "heat up" the machine from a set temperature, and the amount of steam on "run out". Ask for a quality guarantee linked to final payment. Will the supplier warrant that under all conditions your process will be held to specification? If they understand the process, they have the on-staff capabilities to model the process. This is a sign to you of the "depth" of process knowledge. At the end of this exercise; if a supplier is advising against utility monitoring equipment or cannot give you a clear statement of usage and consumption of utilities - it is likely because they are not able. They do not have the capabilities to calculate the usage. This is the reason why many of the more advanced customers elect to stick with the larger more reputable companies. Any supplier who cannot provide a clear estimate of utility consumption - in hard numbers - should be disqualified from your equipment selection process. Your superior will understand that. By not providing those numbers on utility consumption and gaurantees on quality - that leaves your company with the risk. The big savings on your upfront purchase will likely get paid back through your utility bills over 3-6 quarters.